Achieve a flawless false tan with the SKINNY TAN Luxury Application Roller; a fool-proof tool that assists in self-tan application. The intelligent, ergonomic design allows the roller to quickly and easily manoeuvre around body contours, whilst being comfortable to hold. This ensures an even, streak-free tan application. Crafted with a long wooden handle, the roller can be used to target the hard-to-reach areas, including the mid-back and the back of legs. The tool arrives with a soft roller head that glides over skin and can be removed and washed to provide several uses. Expect flawless tan application that appears seamless and natural. Exfoliate skin using Skinny Tan Pre Tan Primer. Moisturise Hands, Feet, Elbows and Knees before applying tan. 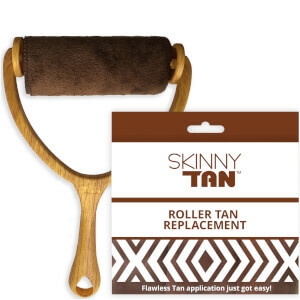 Work the tanner into the roller with initial application and it will begin to evenly spread across the body.